I fell into a conversation with the bartender at O’Hanlon’s yesterday. I was having a celebratory pint after concluding my meeting with Harvard Broadcasting. The bartender asked me what I was celebrating, and I told him about the sitcom. He asked if he could hear the demo. I said sure and pulled out my laptop. He asked if it was online. I said yes. He had me type the address into their computer, and had the demo play to the entire bar over their sound system. It was something special to hear it out loud, in such an iconic public space. The line-up of people asking for my autograph afterwards didn’t quite materialize, because the bar was empty, but at least the bartender liked it. Later in the day I played the demo for Rob Vanstone at the LeaderPost. When the time comes, he said he’ll be happy to write a story about it. At supper Grama shaved off my beard while Jazzy filmed the undertaking on her phone. My face feels amazing, and I no longer have to be strategic about how I sip coffee. I can’t stop rubbing my cheeks. 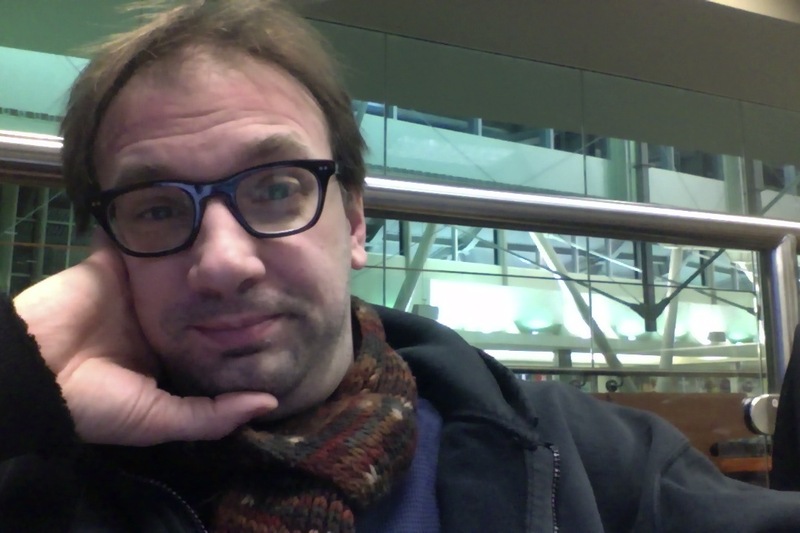 Jazz and I are currently sitting in a corner of the lounge in the Regina airport. Our 6:15am flight has been delayed to 8:40am, so I’ve had a bit of time to sit and muse. Toronto awaits. I leave Regina with some reluctance. The last three weeks have been quite the run. Somewhere in between development on the radio sitcom, and all the familiar faces I took in, my stay here has been one big serendipitous leap from moment to moment. If Toronto can promise the same over the next few weeks, I will not complain. This entry was posted in Career, Jazzy, Life by Jarrett Rusnak. Bookmark the permalink.